Treatments: printed title and Scripture. Features: interior rim decal, dishwasher and microwave safe. 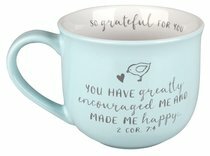 About "Ceramic Mug Grateful For You: Greatly Encourage, White Inside/Pale Blue Outside (2 Cor 7:4)"